In our company CBT approaches are used, one of the tools is creation of value proposition. I must say that value propositions imply a lot of work of all departments, as it is not a slogan but concrete and measurable factors which are manifested in everyday work. During the presentation I will talk about the creation of PC and development tools. In 2004 graduated from the graduate school of management of St. Petersburg state University, specialty “Management”. Has extensive experience in manufacturing company: GC LSR, GC “Uyut”, “Soyuzpushnina”. The main tasks implemented in these companies are related to organizational development projects and process efficiency improvement. 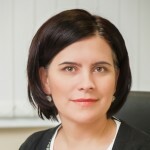 From 2009 to 2012, held the position of development Director in the company” Aladushkin invest”, where she was engaged in the development of new businesses. Prior to joining the “LK” worked in the company “Rosengineering Project”, which led the Department of business support and engaged in the development of non-core areas for the company. From September 2016, is headed by a confectionery Association “Lyubimyy Kray”.